To Garnish – freshly chopped coriander and apricots. To start, heat the oven to 200°C/Fan 180°C/Gas Mark 6. Heat your oil in a flameproof casserole dish, add the onion and cook for 5 mins until soft. 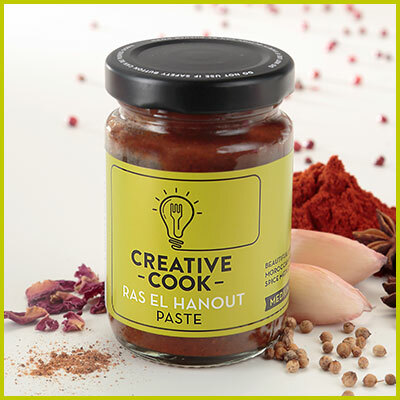 Add the lamb and cook for a further 2-3 mins, then add the Ras El Hanout Paste and mix well. Pop your squash and apricots into the casserole, pour over the stock and bring it to the boil. Put a lid on and transfer to the oven. After 1 hr, stir the tagine and stick it back in the oven, uncovered, for another 30 mins or until the meat is lovely and tender. To finish, sprinkle on freshly chopped coriander and apricots and serve with couscous and / or toasted flatbreads. Simply delicious. For a speedier dish try using chicken thighs instead of lamb and sprinkle with toasted pine nuts and freshly chopped coriander. Or try with chopped peppers, chickpeas and prunes. Serve with herby couscous and garnish with toasted almonds.